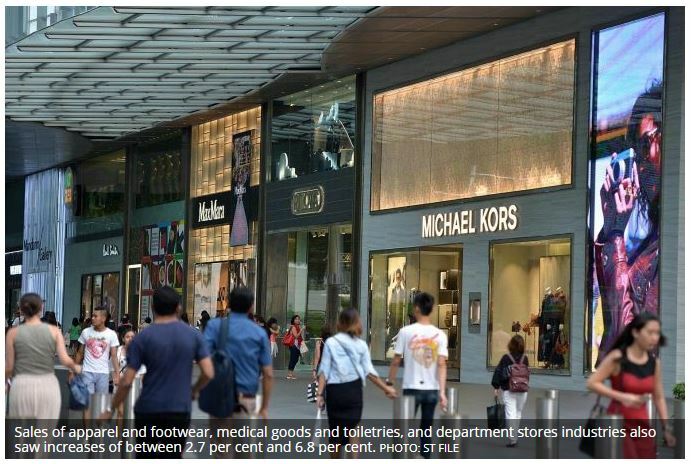 RETAIL sales in Singapore edged up marginally in May, with growth constrained partly by lower motor vehicle sales, according to Thursday’s Department of Statistics release. May’s retail takings were up 0.1 per cent from the same month a year ago, with a total estimated sales value of S$3.8 billion, of which online retail sales contributed 4.3 per cent. Excluding motor vehicles, the rise was more significant, at 2.2 per cent. With increased shopping before the Hari Raya Puasa festive period, furniture and household equipment saw the biggest jump in sales, at 9.1 per cent. Sales at petrol service stations rose 8.8 per cent, due partly to higher petrol prices; after removing the price effect, the rise was just 0.8 per cent. Sales of apparel and footwear, medical goods and toiletries, and department stores industries also saw increases of between 2.7 per cent and 6.8 per cent. In contrast, sales of computer and telecommunications equipment fell 11.3 per cent, while those of motor vehicles fell 8.4 per cent. Takings from optical goods and books, recreational goods, mini-marts and convenience stores, supermarkets and hypermarkets, and food retailers saw smaller decreases of between 0.8 per cent and 3.2 per cent. Lower vehicle sales also weighed down the month-on-month figures, though to a smaller degree. On a seasonally-adjusted basis, retail sales rose 0.1 per cent in May compared to April 2018. Excluding motor vehicles, retail sales rose 0.4 per cent month-on-month. Sales of food and beverage services rose on both a year-on-year and a seasonally-adjusted month-on-month basis: up 1.2 per cent compared to a year before, and up 0.6 per cent compared to the previous month. The total sales value of food and beverage services was estimated at S$689 million, up from S$681 million in May 2017.